Let's get together! 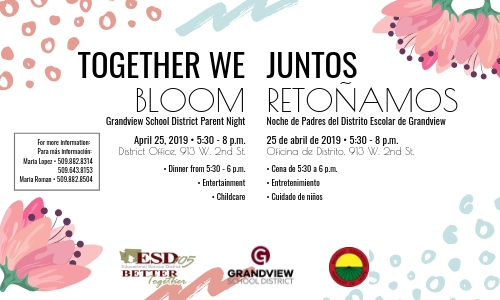 The district is hosting Together We Bloom - Spring Parent Night beginning at 5:30 p.m. on Thursday, April 25. The event will feature a resource fair, as well as information on the importance of attendance, mental health and supporting your student's academic success and so much more. • Dinner from 5:30 to 6 p.m. • Entertainment • Childcare will be provided. For more information call Maria Lopez at (509) 882-8314 or Maria Roman at (509) 882-8504. There is still time to register your student for kindergarten. Each of our elementary schools - Arthur H. Smith, McClure and Harriet Thompson - will be registering students for kindergarten every Friday through May 31. 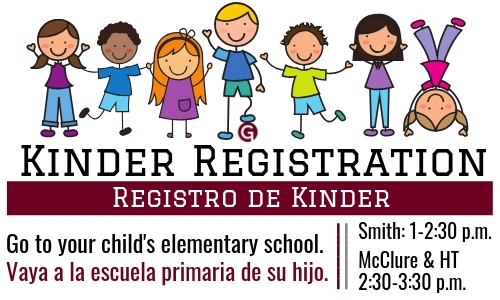 Smith school will be registering students on Fridays from 1 to 2:30 p.m., and McClure and HT on Fridays from 2:30 to 3:30 p.m. To register, your student will need to be five-years old before Aug. 31, 2019. Also be sure to bring your child's immunization record, birth certificate, proof of home address (water bill, power bill, lease or rental agreement) and your parent picture ID. Also bring your child for testing. The district will also be accepting preschool sign-ups during these times. A child must be four-years old before Aug. 31, 2019 to take part in the district's preschool program. 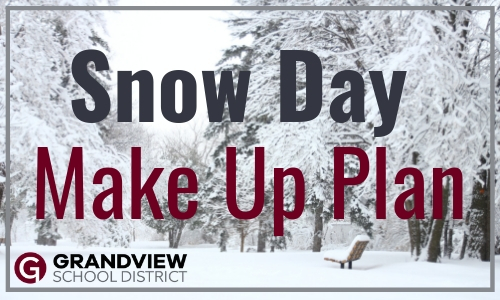 Snow Day Make-Up Plan...last day of school will be June 14. 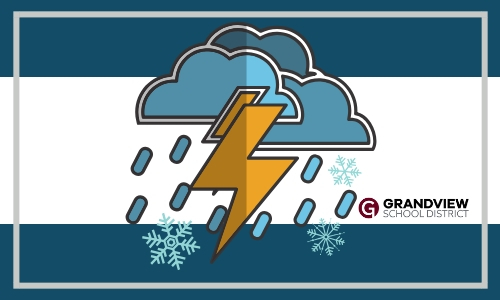 Attention Grandview families – After looking at a variety of options to meet the state’s requirements, the Grandview School District Board of Directors has decided to extend the 2018-2019 school year to make up for lost instructional time due to our five snow days this winter. Please note the changes to our academic calendar: The last day of school will move from Friday, June 7, to Friday, June 14, 2019. The date of graduation will move from Saturday, June 1, to 8 p.m. on Saturday, June 8, 2019, at Grandview High School’s Rich Leenhouts Stadium. Baccalaureate will be at 6 p.m. on Wednesday, June 5, at GHS. Click headline to more information. December is almost here, which means winter weather is on the way. ❄️❄️❄️ Be sure you're prepared for winter weather, as well as possible school delays and cancellations. Visit our website at www.gsd200.org/delays for information. Click headline to find link. The Grandview School District has an app. You’re invited to visit the App Store/Play Store and download our brand new Grandview School District app. The app allows you to get push notifications from your child's school, be the first to know about school delays and cancellations, it gives you a direct link to your student's teachers and school calendars are now in the palm of your hand. Click story for more information. The Grandview School District is inviting community members in for a behind-the-scenes look at what’s happening in our classrooms. From 8 a.m. to 12:30 p.m. on Wednesday, April 24, a group of community members will be touring schools, visiting classrooms, talking to students and teachers and seeing first-hand the wonderful things happening in our classrooms. The event – A Day with our Students – will include classroom visits at Grandview High School, Grandview Middle School and one of our elementary schools. The group will start their day with a social from 8 to 8:30 a.m. at the District Learning Center, 313 Division St., then they will tour the district, traveling from school-to-school via school bus. The event will end with lunch at the learning center. Anyone interested in attending is invited to call the district office at 882-8500. Please reserve your space no later than Friday, April 19. Do you & your students want to know what's for lunch? Keep up-to-date with mobile app. Remember, finding out what's for lunch or breakfast throughout the district is as easy as checking your phone. This year the school district has started using Health-e-Living to create and broadcast our menus and a part of that is the My School Menus app. The app is available in the Apple App Store or the Google Play store under My School Menus. The app makes it a snap to find out what's cooking.